As cheese adds nutrition, taste, and a longer shelf life to food products, its demand in a wide array of food and beverages is rising substantially. Consequently, the global cheese powder market is also witnessing a tremendous increase in its valuation and expansion in its market size. Cheese powder is mainly utilized to add flavors to instant food items, baked food, and seasonings. With the changing lifestyles, where consumers do not have enough time to cook a complete and nutritious meal, they tend to cover up with ready-to-eat meal with nutritious value, which requires cheese powder. 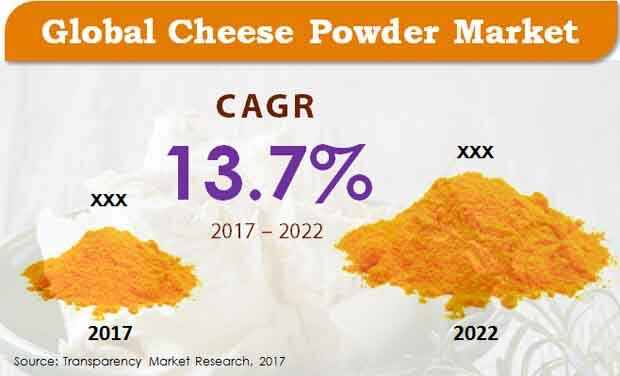 As per Transparency Market Research (TMR), the worldwide market for cheese powder is anticipated offer an opportunity worth US$355.9 mn by 2017. Further, the market is projected to strengthen at an impressive CAGR of 13.70% over the period from 2017 to 2022 and reach a value of US$677 mn by the end of 2022. The global market for cheese powder is broadly assessed on the basis of the type of the product, end user, and the application. Based on the type of product, the market is segmented into Swiss cheese powder, cheddar cheese powder, mozzarella cheese powder, parmesan cheese powder, and blue cheese powder. The demand for cheddar cheese powder is comparatively greater than other types of cheese powder, making it the leading product segment of the global cheese powder market. Cheddar cheese powder is likely to remain witnessing a strong demand over the next few years, thanks to the increasing preference for convenience food items across the world. By the application, the worldwide market for cheese powder is categorized into sweet and savory snacks, bakery and confectionery, ready meals, sauces, dips, dressings, and condiments. Sauces dips, dressings, and condiments are reporting the most prominent demand for cheese powder, worldwide, and is closely followed by sweet and savory snacks. Various industries, such as food and beverages, and individual consumers have surfaced as the key end user of cheese powder, globally. In terms of the geography, the worldwide market for cheese powder is spread across Europe, Asia Pacific excluding Japan (APEJ), North America, Latin America, the Middle East and Africa (MEA), and Japan. Proliferating at a CAGR of 12.70% between 2017 and 2022, North America, the current market leader, is anticipated to continue on the top over the next few years. The increasing preference for convenience food items among consumers is the key factor behind the substantial rise on this regional market. With the augmenting consumer pool of ready-to-eat meals, Europe is also registering a steady rise in its cheese powder market. Among other regional markets, Asia Pacific excluding Japan is expected to demonstrate the most promising opportunities for growth in the near future, owing the high population density in this region. The rise in disposable income of consumer, enabling them to afford expensive food products, is also projected to propel the APEJ market for cheese powder in the years to come. Kraft Heinz Co., Kerry Group Plc, Thornico A/S, Dairy Farmers of America Inc., Land O'Lakes Inc., Bluegrass Dairy & Food Inc., All American Foods Inc., Aarkay Food Products Ltd., Kanegrade Ltd., and Archer-Daniels-Midland Co. are some of the leading cheese powder vendors across the world. The worldwide cheese powder market is extremely competitive and fragmented. Kraft Heinz Co., Kerry Group Plc, Thornico A/S, Dairy Farmers of America Inc., Land O'Lakes Inc., Bluegrass Dairy & Food Inc., All American Foods Inc., Aarkay Food Products Ltd., Kanegrade Ltd., and Archer-Daniels-Midland Co. are some of the leading players in the global cheese powder market.